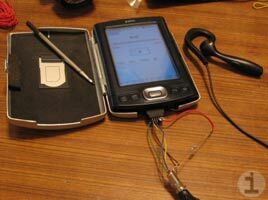 PalmInfocenter member and reviewer twrock has posted details about his external headset mod for the Palm TX. He added a smaller 2.5 mm headphone/mic port to his TX in an external adapter that connects to the athena hotsync port. Ron intends to use it for voice recording and for future VoIP applications. You can check out more pictures and details in the PIC forums. What Palm should have not left out in the first place! It's pretty silly for enthusiaists to have to make it work. How much money does Palm save by leaving out a microphone anyway? RE: What Palm should have not left out in the first place! It's not silly, in my opinion. It's stupid. In 1997, there was "geek cred" to be had making PalmPilots do things they weren't originally designed to do. Remember the PalmPilot robot kit? Back then, "enthusiasts" showed just how much these little units could actually do. But to have to hack and cobble "solutions" to problems Palm created by REMOVING features from the design plan? That's just wrong. It's also why I'm considering a 3 year old T3 rather than a TX. I think someone here or on Brighthand calculated that Palm saves approximately 50 cents per unit by omitting a mic. They already have a lovely Voice Recorder app on the LD that runs just fine on the TX. if anything, the most expensive cost would be the retooling to the plastic casing. I had the idea last year that Palm could "fix" most of the T5 & TX's flaws by simply redesigning the TOP panel of the unit and leaving everything else intact. FrankenGarnet is EOL'd and on life support. But that doesn't mean the hardware has to follow suit. Here's my idea on how Palm could retain the "classic" T|E formfactor and bring it up to speed enough to finally make it a T3 successor and send POS out with a bag. -Add an opening with a mic under it to the right of the headphone jack. The VR would have to be toggled by either one of the hard app buttons or via software but it's still be THERE in some capacity. Then internally Palm could stick in a higher capacity battery (has everone forgotten that the TX's battery is SMALLLER than the T5's?) and put the T5's 416mhz CPU back in there. On top of that, add a small internal storage drive ala T5 (256mb or so) which would be plenty when combined with the 128mb program RAM and a 2gb or 4gb SD slot. Indcrease the heap size while you're at it, Palm. And test it with a wide variety of 4gb SD cards and call it "SDHC-compliant". Bingo! There's your TX2. Launch it this fall for $300 or less and watch the POS faithful go nuts stockpiling them. A TX2 like that and a Treo 700p would make a nice 1-2 punch to make up for years of Palm's shoddy quality, frugality and stick it to the consumer attitude. Good question. I know there's more to it than just the cost of the parts, but a mini microphone would cost me the equivalent of USD $0.60 at retail. Obviously a manufacturer could get them much cheaper in the quantities they buy. In the case of the TX, the rest of the circuitry is already there, so you only have a minimal increase in labor to solder in that part during manufacturing. I suppose you could consider the R&D cost that went into the microphone capability, but since they didn't put a mic in the TX, that really can't be part of the equation. Then there would be the potential cost for warranty repair on any additional feature. There are probably other factors I haven't considered as well. But I really can't come up with any huge savings for Palm by not including a microphone. In the end, you'd be hard pressed to convince me that this decision wasn't primarily a case of limiting the feature set of the TX in order to avoid competing with the LifeDrive. Personally, knowing that I can have voice recording and VOIP (if it really ever arrives) for my TX eliminated my biggest disappointment in purchasing the TX. (I can live without the LED and vibrating alarm, but they'd be nice too.) I still really like this particular Palm even with its limitations. Does anyone know if there is a way of using a Bluetooth head-set with the TX or other BT Palm PDA's for music, voice memo etc... rather than having cables? That will work for headphones, but not for headsets. Just FYI. As far as I'm aware, there's no way to use a Bluetooth headset for audio input. Sorry, the prototypes have already been "acquired" by another party.